A township established in the late 1800's, Opua has fewer than 1000 residents but boasts it's own school, post office, a modern marina, a large wharf, yacht club and the historic over-water Opua Store where you can find almost everything you need, from freshly baked croissants to fish hooks, wine and beer. Every year some 400 international yachts arrive in Opua, their first port of call in New Zealand, enhancing the atmosphere of the small town with international flavours and languages. 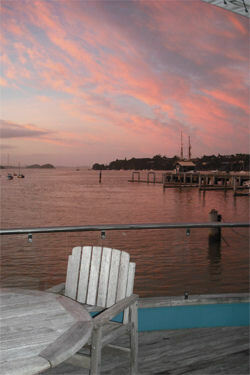 For some of these sailors it was love at first sight and they are now counted among Opua's residents. 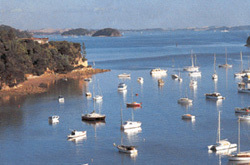 The Bay of Islands is a favourite playground for lovers of anything aquatic, with 144 islands and a wide range of activities. Dolphin watching, sailing, diving and fishing are just a few of them. For land lubbers, there are tours to Cape Reinga; the panoramic Waitangi Golf Course, coastal and rainforest walking tracks, and Maori culture to experience. For food and wine lovers there are vineyards to visit and fresh seafood to be tasted. On arrival your host will assist you with all your enquiries. By car - Opua is three hours north of Auckland via State Highway 1. After Whangarei follow the signs for the Bay of Islands. Follow the signs for the Opua car ferry. The Boathouse is located next to the ferry ramp. By air - The Kerikeri airport is 30 minutes from Opua.